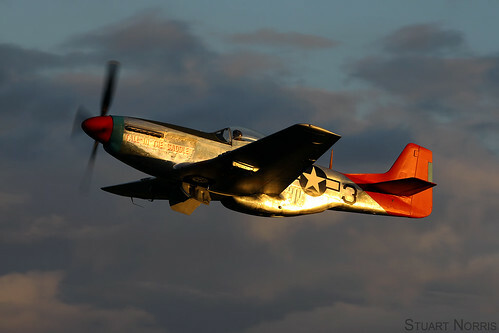 Peter Teichman seen departing Old Warden flying "Tall In The Saddle" in some georgeous early autumn light. The P-51D is painted in the markings it wore while assigned to the 332nd Fighter Group the Tuskegee Airmen, better known as the Red Tails. Lt Col George Hardy who flew this actual P-51D on 21 missions in 1945 during the later stages of WW2, for which he was awarded the Air Medal for meritorious achievement, was the guest of honour at the air show.